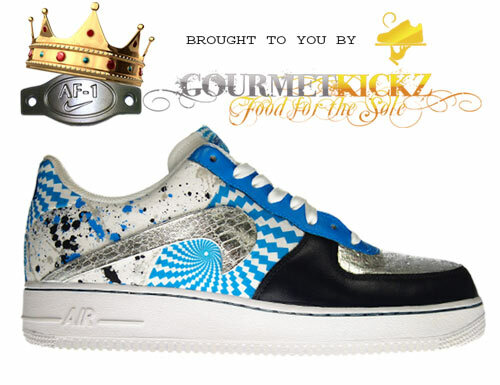 This custom masterpiece of mine is a spin-off of my famous Hypnotiq-Blues AKA HypnoBlues AF1 Low. Influenced by my collaboration with 1800 Tequila and their intoxicating Silver line, these feature the most notable details of the classic HypnoBlues and are topped off with a splash of croc-silver fabric! It doesn’t get much better than these! From the 2008-2009 1World Project AKA Influencer Pack, this particular pair is from world renown soccer star Rio Ferdinand. Packed with loads of detail; gold contrast stitching to tucked seamless smooth leather, croc print accents, a metallic gold swoosh, and some laser etched aspects. These sneakers stand out from all the other 1Worlds making them very special in their own way. What makes them stand out perhaps from any other AF1 ever released is their unique milky white translucent soles, earning them a nickname I gave them personally…”The Milkmans”. Ha ha! 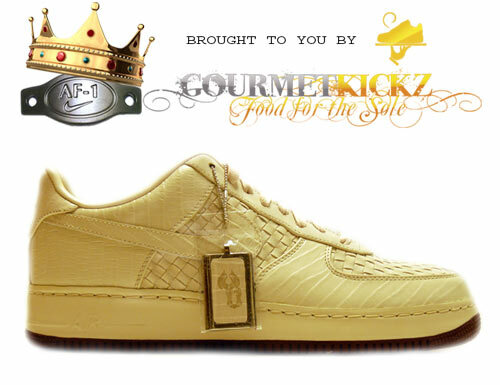 Back in 2005 the biggest buzz in the sneaker world surrounded the Nike AF1 x Mr. Cartoon collaboration series. This Blue Tattoo Quickstrike AF1 was released to the public after the initial design for the Blue Tattoos was cancelled due to an infringement on the Spiderman franchise. The Hyperstrike version of this sneaker (which is of course stashed in my collection) has a sick spiderweb on the toebox. But fear not, these Quickstrikes are nothing to laugh at, though they do have a clown on their toebox ha ha! Note the detailed laser etching that depicts elements from Mr. Cartoons lifestyle and cultura. Inspired by the request of a special customer, this custom sneaker represents the client’s love of kung-fu movies and his affiliation with the U.S. Military. This sneaker is a great collision of both worlds. It uses authentic military BDU fabric and satin oriental patterned fabric. This sneaker also uses suede piping to accentuate some of the oriental fabric panels. It is truly a masterpiece! Click here to buy now! *This is a custom made to order sneaker and can take from 6 to 9 weeks to complete. Unbeknown to many is the existence of the Yi JianLian AF1 1Worlds. There were actually 2 pair of “Scorpion AF1″ that were designed by the 7 foot Nets star. What you see here is the second pair which were never featured on the Nike 1World website, and never available for retail. I however, was able to score just a few pair from the 1 and only source who touched these stateside. The most unique feature of these AF1’s is that they feature elements from both the HTM series and the Lux series of Air Forces. The Scorpion II’s pull the leather croc print from the HTM’s and use the woven element of the Lux series with a bit of a twist; the woven portion is suede instead of leather! 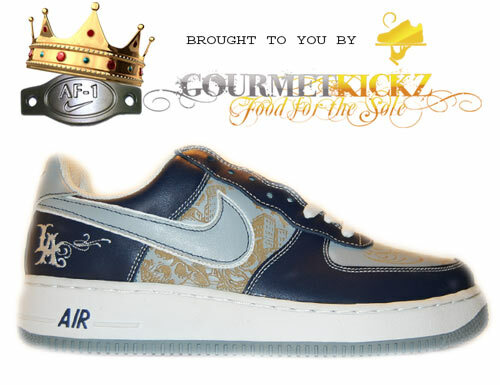 The Nike Air Force 1 Low Premium Harlem Laser edition was released in 2005 as a NYC exclusive. It was the first in a series of only two city themed laser map white/white AF1 Lows. This being the first of the two was highly sought after and became the object of desire for Nike Air Force collectors all over the world. Sneakerheads clamored to get a pair of these with little success. I however, being the Chef just happened to walk into a little shop in the Bronx just as they opened and was able to purchase over 20 pairs of these beauties. Luckily I have deadstocked the majority of these for more than 5 long years. 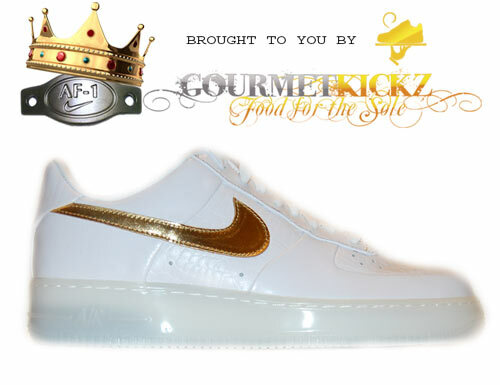 Purchase a pair after the jump or in the store section of AF1 King. If you have been on the net searching for a pair of these exclusive Nike Air Force One Premium Snakeskins from 2005 and wondered why you cannot find a good size anywhere…. Well the answer is that I have been keeping a large number of them deadstocked for over 5 years! Here is your chance to own a pair of these insane AF1 Lows. 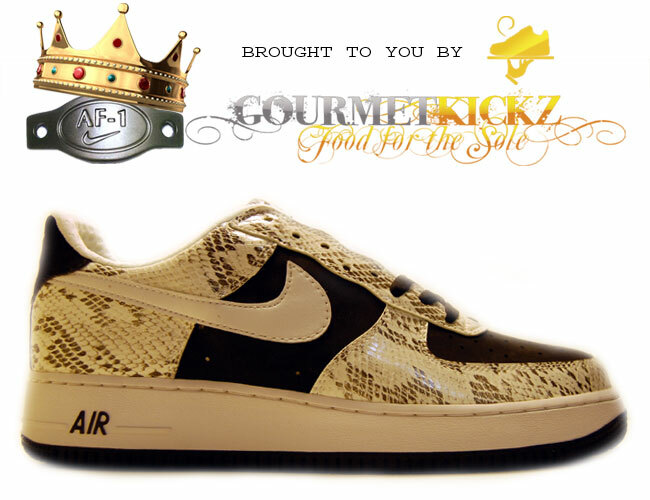 They are part of a very rare class of Nike Air Forces to have been adorned with snakeskin. This pair is particularly special as it uses both nubuck and snakeskin for the outer construction. These exclusive kicks were released as quickstrikes to urban Nike accounts and sold out very quickly. You can purchase them now at long last after the jump or by clicking the picture above. Recently Nike jumped into the popular sport of snowboarding by introducing the Zoom Force 1 snowboot. In tandem with this release, Nike also produced a limited run of Nike Air Force One High ZF sneakers. This series is designed to mimic the full Zoom Force 1 edition. 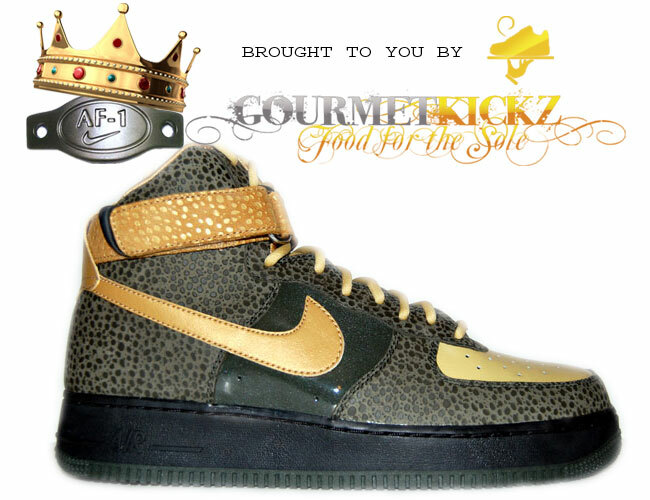 The pair pictured are the Nike Air Force One ZF Safari. They are from my personal collection and are a size 10. 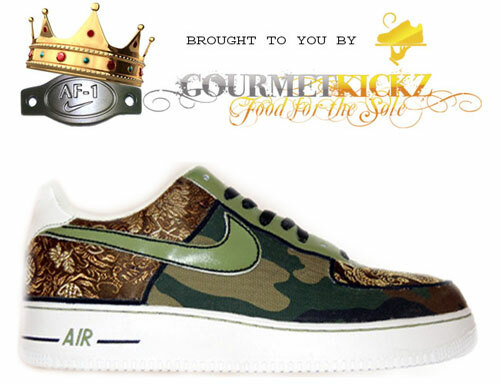 They can be purchased after the jump as well as on the AF1 King Online Store.